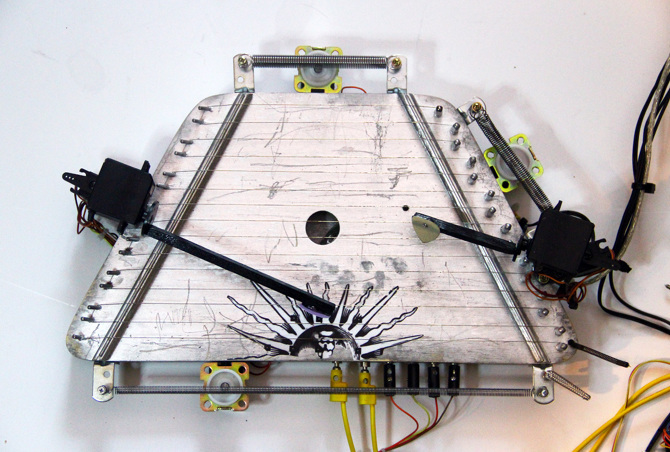 ::vtol:: “turbo-gusli” demo performance from ::vtol:: on Vimeo. Musical instruments: make a move, get a sound. Such are the mental excursions of one ::vtol::, aka Moscow’s Dmitry Morozov. He’s been busy over the past year or so, wearing robots that interface with tattoos to make music and constructing surround sound umbrellas. And we still have more crazy-science goodness to share. The “turbo-gusli” or “gusli-samogudy” – top – takes a Russian folk instrument and has it play itself. Built with Arduino and Pd and inspired by the folk tale notion of a self-playing instrument, this robotic instrumental player reads your thoughts via EEG adapter. Via Animal New York’s Sophie Weiner, who’s been following this stuff. ::vtol:: “turbo-gusli” + emotiv EPOC neuro EEG headset from ::vtol:: on Vimeo. 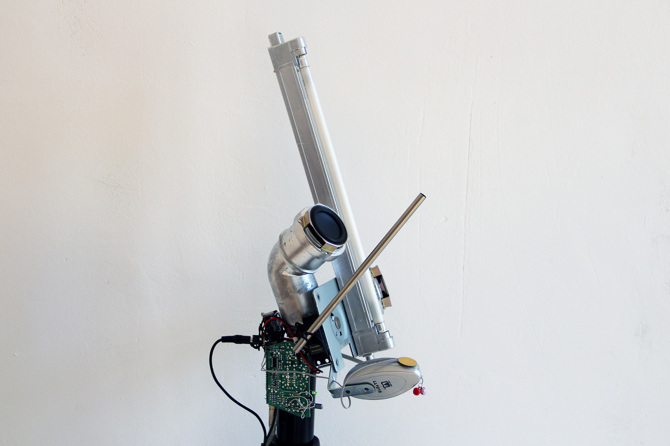 ::vtol:: “turbo-gusli” setup from ::vtol:: on Vimeo. 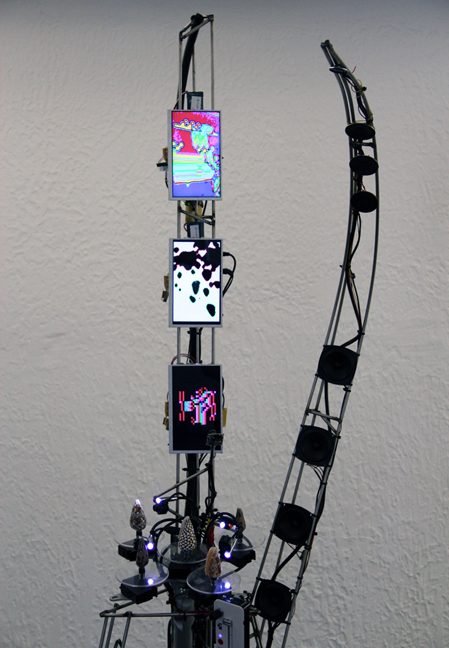 The EGOphone responds to online social interaction with glitchy musical serenades. Add Facebook, Twitter and VKontakte likes [VKontakte is second only to Facebook as the popular social network in Russia], and you get a sonic answer. ::vtol:: “egophone” from ::vtol:: on Vimeo. Lastly, conus takes the possibilities of Cellular Automata – the famous generative algorithm – to a new level. Rather than directly working with the algorithm, it reads it from its natural habitat, scanning seashells and making visual and sonic output from what it sees. ::vtol:: conus from ::vtol:: on Vimeo. Other equipment – steel, motors, plastic, DIY microscopes and electronics. Special thanks to: Alexandra Gavrilova (stain.ws), Boris Kislitsin. 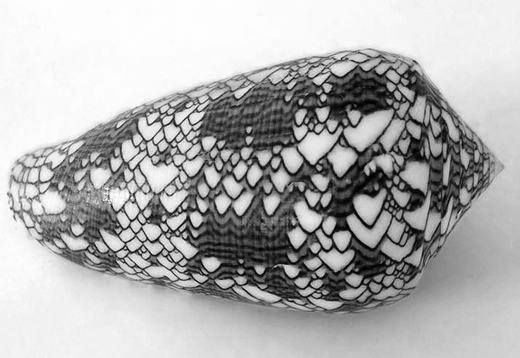 Starting with a mollusk whose black and white patterns neatly follow the cell-by-cell rules of the algorithm, the artist makes the artificial out of the natural – or is that the other way around? Topping a metal sculptural creation with brightly-colored displays, the installation itself is worthy of the early Russian avant-garde, a mini-architectural tower of algorithmic output. I can’t wait to see what vtol does next. Catch him in a performance, opening, or workshop near you.